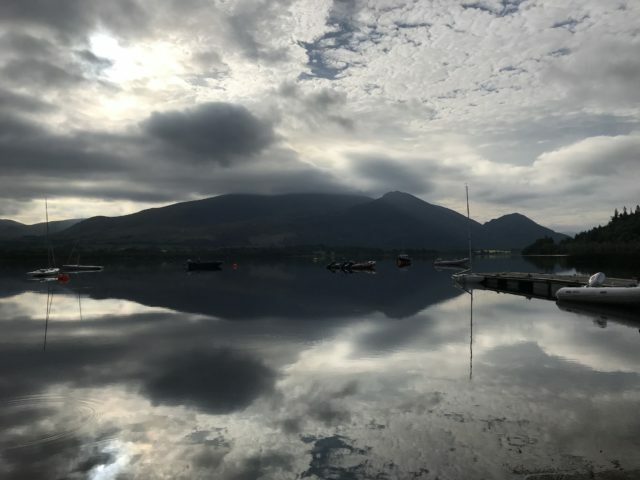 Did you spend your holiday with us at Bassenthwaite for our annual regatta? Hopefully you returned home safely, caught up on your washing (and sleep), and looking forward to Bass Week 2019! The Bass team are always striving for continuous improvement and in this respect we would like your feedback on this year’s regatta. If you have 5 minutes to spare please click on Questionnaire 2018 and let us know what was good about this year and where we can improve. For every 25th completed survey, the lucky individual will receive a £25 discount voucher off next years entry. Congratulations to Sailing Secretary Joe Roberts on winning the first £25 voucher. Further congratulations go to Jonathan Garfitt and Fay Kerr on winning the second and third £25 vouchers. Time your submission well and you could be next! Booking your holidays for 2019? Want to join us for another great Bass Week regatta? Don’t forget to reserve 3rd-11th August 2019, entries will be open from mid April! The glorious 12th brings Bass Week to a close for another year. A very wet night wasn’t appreciated by those needing to take down tents and awnings, but it did stop in the morning, and it was much milder again to help dry things out. The wind was somewhat fickle, but there were many boats wanting to sail as various fleets had several boats in contention for their respective trophies. After a short postponement, racing was underway but the wind promptly eased, and then swung so much the beats disappeared for a while as a southerly filled in. 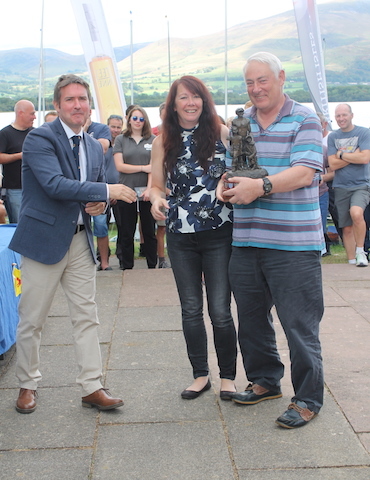 The race was the final of the weekend, and Bass Week 2018, and was followed by the prize giving during which Commodore Robin Dawson thanked all the volunteers who had put in so much effort during the preparation for, and during the week, to deliver what we hope was a successful event for competitors and the club alike. Of those that survived the full week, some special perpetual trophies were awarded. Nigel O’Donnell gave a vote of thanks to the club for delivering a great event in a location with such stunning scenery. Perhaps you would like to join in next year from 3 – 11 August 2019? A beautiful morning for the final weekend’s sailing. The forecast southerly didn’t settle so racing was postponed for a while until a south westerly filled the bay. It proved to be a day of shifty winds that strengthened and swung more to the south as the afternoon went on. Indeed, for the third and final race of the day, the course took the fleets halfway down the southern end of the lake for the first time during the regatta. Despite the southerly, sailors had to contend with more shifty conditions. No doubt there will be a final evening of dancing and celebrations through to the early hours, hopefully not dampened by the forecast rain which has held off for another day. Just one race remains, and then it’ll be time to pack up before the weekend’s prizegiving. Overnight showers have passed through but likely to continue throughout the day, but a good force 3 is forecast to keep the sailors happy. Just for a change the wind played tricks by blowing from the south instead of the forecast west, and then faded as the rain came back in. It seemed that the wind had settled to a southerly so after a 90 postponement a course was set, only for the westerly to kick in. Another rain shower killed the breeze for a while, then there was a brief squall that capsized a few boats. Quite a mix all in all. By the 2nd race the rain had passed and the wind strengthened again- just the usual combination for the ladies, juniors and seniors race! The third prize giving of the week will be held this evening before the live band keeps everyone entertained. Fresher winds led to a few capsizes through the day, and the sun broke through for another glorious evening. The RNLI pursuit was raced in the afternoon, with a Tera Sport leading the fleet for the first three legs until caught by the Mirrors who kept hold of it through to the end with Rob Cook and daughter Elizabeth taking the honours. A lovely morning to start the day, with some good winds forecast for the two race series. Unfortunately the forecast high risk of showers came true with a vengeance over lunchtime, and they lingered on until racing started taking the strength out of the wind for a short while. Once the black clouds disappeared, the wind returned. 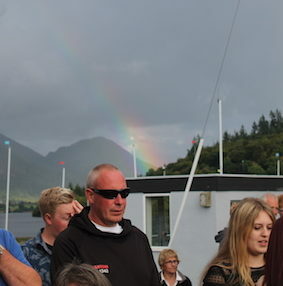 As the threat of showers remained, the prizes were set up under a gazebo for the 2nd prizegiving of the week during which a rainbow appeared nearby but the rain missed us. An evening of dancing lay ahead for many! Is the summer weather slipping away from us? A drizzly start to the day, with a light wind wasn’t the most enticing combination of sailing conditions, but racing did get underway on time for those that chose to sail. The Nairn Pursuit was held in the afternoon, and as the sun started to break through the clouds, the lead Mirror helmed by Graham Vials with son Sebastian crewing, sailed in to the sunset to win the trophy some minutes ahead of local brothers Sandy and Douglas Simpson, also in a Mirror. A stirling effort by AJ, crewed by Ginger Phil, in a GP secured 4th overall behind Chris and Chloe Parker in a Graduate. The evening entertainment proved that Bass Has (up and coming) Talent with a wide range of acts by the junior contingent, expertly compered by Wendy Somerville. A cloudy, drizzly morning wasn’t the order of the day, but that’s what the DragonForce sailors had to endure in the first planned race. There was a good turnout of boats, perhaps too many for the jetty which seemed to be creaking under the load of helms! There was a few uncooperative boats that had to be attended to from kayaks, but the wind was sufficient to get the boats buzzing around the course. The afternoon race has often been raced around the lake, and the OD had noted that the wind was suitable, but as the course was being set the south westerly took over, and the course area was changed to the northern bay. However, many sailors reported that the winds in the bay were as shifty as if the race had been down the lake! Another calm morning. The wind will fill in, but how much will there be? After a two hour postponement racing got underway at 1pm with a light westerly that built up as the day went on. Again the sun broke through late afternoon for a glorious evening. There were some protests lodged in the first race, perhaps the sun was raising temperatures in more ways than one? Apparently when Hamilton Roaf fell out of the boat whilst racing in the Graduate, crew Alistair hauled him back in the boat and gave him an earful! Unfortunately Alistair fell out of the boat today – perhaps the slowish response of Hamilton to turn round and pick him up was to be expected?! The first prize giving of the week will be held tonight followed by a quiz night. Early morning mirror like conditions faded quickly as the wind filled in with plenty of time before the 1pm race. There was a slight delay waiting for boats to launch but racing was soon underway for over 100 boats across 10 fleets. The wind held, and the sun shone, for the rest of the day’s racing. The Commodore’s reception was hosted by club officials and trustees, who welcomed patron Lord Egremont, and all visitors, with a glass of ONE spirit. The evening finished off with the first disco of the week. 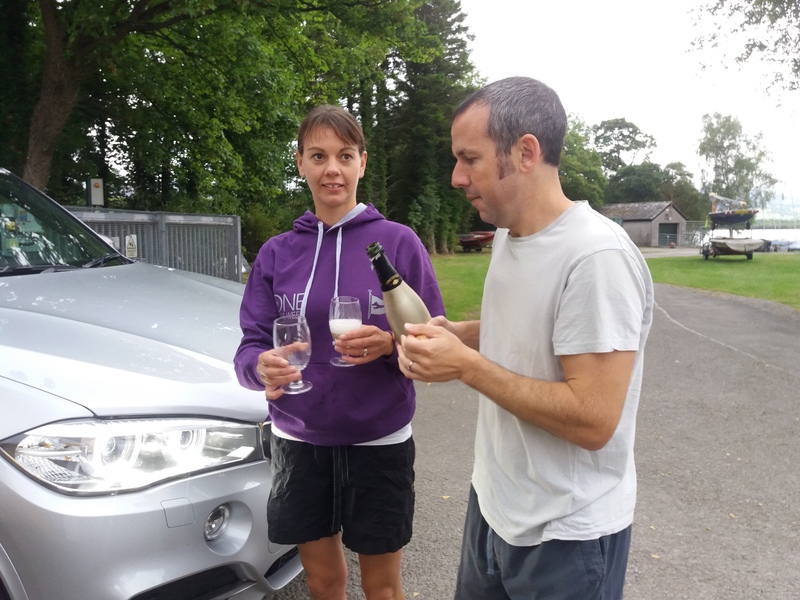 Can’t promise fizz for every arrival! Come on in, the gates are now open. Caravans, tents, and even boats are arriving. It must be Bass Week – Have a great regatta! The day suffered some brief showers, some travellers had a couple of holdups, but the prospect of some One G&Ts in the bar saw them through! 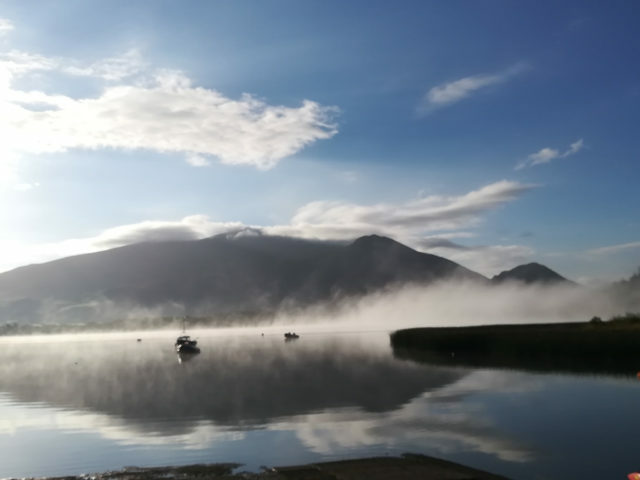 On behalf of the members of Bassenthwaite Sailing Club I would like to extend a warm welcome to you. Much of what goes on during the week will be familiar to our frequent visitors, and, in addition we have taken into account the valuable feedback provided by our guests and members following last year’s event. 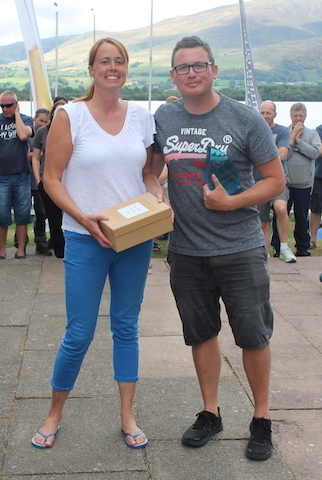 Joe Roberts, our Sailing Secretary, has organised a comprehensive racing programme which, together with the varied conditions that will no doubt prevail, will hopefully result in close and competitive racing. We will continue with the revised format for the pursuit races that have been successful for the last few years (with a moving finishing line). We are delighted to have secured The Lakes Distillery as our lead sponsor again, together with a range of further sponsors throughout the week. You will find many of their flyers in the welcome pack. Thanks to our social secretary, Jo Van Lachterop, we have a packed entertainment programme. Lookout for notices on the board for children’s activities and any other updates. • The reception office will be open all day on Friday 3rd August and Saturday 4th August and all morning on Monday 6th August and Saturday 11th August. If the reception office is not open and you need some help just ask for one of the Council Members (bar staff will happily point you in the right direction). • Parents/Guardians of competitors under 18 years old are required to complete a medical consent form. To save time the form can be downloaded here and handed in at reception on arrival. • We have regraded the bottom camping field. In order to protect the grass we will NOT be allowing cars onto this area. If you choose to camp here, cars will be able to unpack next to the camping area and assistance will be given to transporting your tent etc. to your desired pitch. • This year Trident UK will be providing an onsite chandlery until Wednesday. Please see details enclosed in the welcome pack for opening times and contact details. • We are really pleased to welcome Alfie’s Events caterers to Bass Week. They will be offering breakfasts, lunches, evening meals and snacks, and I hope that you will support them. The menu plan is very varied and they do chips! Friday: Pie, mash and peas. • Cycling in the vicinity of the Clubhouse, and in and around the dinghy park, is not permitted on safety grounds. This particularly applies to small children with sharp handlebars. • We are conscious that bottles, broken glass or other sharp objects can be found in the lake and would therefore request that everyone wears appropriate footwear and is extra vigilant in and around the lake shore, whether they be sailing or playing. • In respect of playing around the water’s edge, we ask that the slipways are kept clear for launching and recovery at the start and end of each race. Don’t let this stop the fun though! • We urge non-competitors to avoid using the shower facilities during the hour either side of the conclusion of racing each day to allow the sailors access. • Virtually all those involved in organising and running the event are volunteers, we would therefore ask everyone to please tidy up after themselves whenever and wherever possible. • Only alcohol purchased at the bar should be consumed within the club house. Naomi Smith, our Vice Commodore, has chaired the committee responsible for arranging our regatta week this year and will be available on site throughout the week for any issues that may arise. Naomi and her family can be found in caravan position 3 on the top field. Other members of Council will be pleased to lend assistance should Naomi not be available. As ever, our regatta week is organised and run by a dedicated team of members and we continue to be very grateful for anyone who is willing to give a hand with tasks such as race office or rescue duty, etc. Please have a word at reception or with Naomi, myself or any of the committee members if you are able to lend a hand. 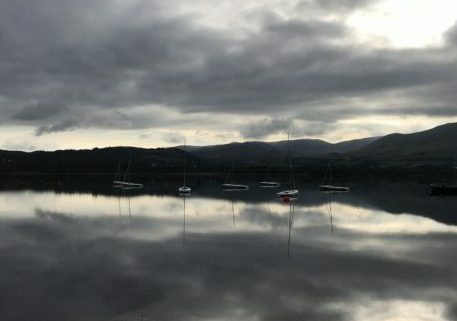 Finally, Becky and I hope that you will be able to join ourselves, the Council and members of Bassenthwaite Sailing Club, at the Commodore’s reception on the evening of Saturday 4th August. Best wishes and please accept our thanks once again for choosing to spend your holiday time with us this year. We look forward to seeing you in a few weeks’ time for what promises to be another excellent Bass Week. There are just a couple of updates to bring to your attention. This year we have a new catering company joining the Bass Week team. Connor Graham is from a sailing background and we are very pleased to have him and his staff on board. Alfie’s Event Catering will be providing breakfasts, lunches and evening meals with snacks available throughout the day. As in previous years there will be an arrival meal available on the first evening. This is a pre-bookable meal, so please order via the Bass Week website. Book via online entries and Webcollect. Trident UK will be on site for the majority of the week to provide an onsite chandlery service. We are very pleased to have the support of Trident UK again for Bass Week 2018 and we hope that you will utilise their services. If you would like them to bring orders over for you, please contact them before the event. Can I just remind all competitors and their families that clothing is only available to pre-order again this year.So please see the website to order your garments before your arrival. There will be no clothing on sale during the event. Ordering is done via the Bass Week website. Click online entries and order Bass Week Merchandise via webcollect. Orders must be made by Friday 13th July. We now have a card machine for payments at the bar! The disco on the last evening of Bass Week 2018 (Sat 11th) will have a “Full Moon” party theme. Everyone is encouraged to wear neon/beach wear/Hawaiian clothing. We have once again secured the field next to the club site for car parking – this is easily accessed via the gate & path in the back camping field. Please can all competitors and visitors that are not staying on siteuse this area for daily car parking. Car passes for parking on site will be issued to those who are staying on site. Disabled parking is available onsite. We are running a DF65 event on the Monday morning of Bass Week 2018, so please remember to bring along your boat! Naomi Smith and the Bass Week team. The caterers are open on the evening of Friday 3rd August. If you’ve had a long drive, and busy day setting up your camping position, and boat, why not have your meal made for you? You can dine in the clubhouse, or take it away. 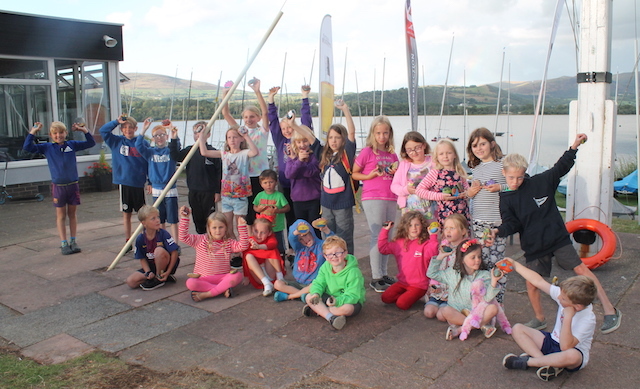 Entries are now open for The ONE Bassenthwaite Lake Sailing Week 2018. The Bass Week team have been hard at work for many months to ensure that this years regatta will provide both members and visitors with yet another excellent event. The racing programme will follow the usual format of 17 races – these being a mixture between small series, one off races and all fleet pursuits for dinghies with a PY in the range 847-1432. This year also sees the introduction of “The Dragon Force Derby” for those of you with DF65 model yachts. This event should hopefully prove to be a popular addition for both the participants and spectators! We have a full social programme planned with a very varied selection of evening events. So there should be something to suit everyone. More information will be given on arrival at Bass Week 2018 regarding the additional daytime and evening activities on offer. We are very pleased to have Alfies Outside Caterers as part of the Bass Week team this year. They will be providing hot/cold meals, drinks and snacks throughout the racing days. The menus they have produced sound fantastic so they should keep us all very well fed and watered throughout the regatta. As usual there will be a welcome evening meal on Friday 3rd August which is a pre-bookable meal via your online entry. If you have any food allergies or intolerances please could you let us know via [email protected] or comment via your online entry form, as the caterers are very keen to ensure that they can provide a service for everyone. The Bass SC bar will be well stocked, and staffed throughout the week, and the introduction of a card payment system should make life easier when you run out of cash! Our grounds team have worked hard throughout the winter and will continue to do so throughout the summer in the run up to Bass Week 2018. This will ensure that the club site is at its best for your arrival. We have already made several improvements to the site based on feedback from last year. We look forward to seeing you all in August. Happy Sailing. Naomi Smith (Vice Commodore) and the Bass Week team. Booking your holidays for 2018? Want to join us for another great Bass Week regatta? Don’t forget to reserve 4th-12th August 2018, entries will be open from mid April! Bass Week fees for this year have been agreed, and the brochure is being prepared with an expectation that entries will go live week commencing 16 April. We are pleased to be engaging the services of Red Seal Rescue to support and supplement our own rescue facilities throughout the regatta again.